In the first pAsuram – AzhvAr divined about the series of help of emperumAn to him, starting from removal of dhEhAthmAbhimAnam through giving him the destiny (divine feet); in this pAsuram – AzhvAr divines about the removal of his mistaken thought of the three lords as equals. Is it not implied when it was said in previous pAsuram itself as ‘eNNum ponnuruvAy’, that is, about distinguished supreme quality of His nature? Based on ‘simha avalOkana nyAyam’ (like a lion after eating its prey and walking away would turn back to look at the prey just to reconfirm), looking at all His help, even if His other help are digested, is it possible to digest the great help of breaking the doubt of equality among the three lords? – thinking of that, AzhvAr is again thinking about this particular help of emperumAn. (How great is this particular help?) Is this help like the (relatively less significant) help of saving me from vishayAnthara prAvaNyam, or is this help like the (relatively less significant) help of the danger of kaivalyam – says AzhvAr? AzhvAr says that emperumAn showed me the ways of the One as the lord and the other two as subservient, and, the other two as created and the One as creator. em adigaL uruvam – IS the form of sarvESvaran who is the lord of everyone. pAr uruvi – Earth that is of hard make up (pAr -> pARai -> hard rock). urvi is in the language used by the noble learned people (Aryas), that is, samskrutha word which means earth. It got transformed into thamizh word uruvi here. The word pAr is Not to mean earth here – its meaning is from pARai (hard rock) that it is a hard material like a hard rock. By this, – compared to other core elements (like air, fire, etc. ), this is different and having the hardness – the earth. It is since mahAn etc., are in sUkShma (subtle) form (not visible to people’s eyes), and so would be difficult for people to understand; so AzhvAr talks here only about those that are sthUlam (gross, can be perceived by the senses of the body) (they are pAr, neer, eri, kAl, etc. mentioned above), and and since these are the (immediate) direct reason for creation of the aNdam; and so this is about nithya srushti (more frequent continuous creation activities of emperumAn). rishi (parAsarar) too said ‘bhUthEbhyONdam’ about the direct/immediate source. Saying pAr mudhalA is based on order in which they go through annihilation. Agi – would this word indicate that creation? (Agi is ‘becoming’, Akki would mean ‘creation (but it would also mean creator)) – Since AzhvArs are vEdhAnthis (followers of vEdhanthas), AzhvAr is divining based on the Sruthi of ‘bahusyAm’ (I shall become many things (That is, being sareeree of them (they being part of His body) and his being nirvAhakar (controller))). But, considering ‘AkASadhvAyu:, vAyOragni:, agnErApa:, adhbhya:pruthivee’, where it says one is the reason/source for the next one’s creation, is it correct to say that He is the reason/source for the creation of All of them? As said in, ‘thEja: aikShantha, Apa aikShantha:’, (desire of emperumAn to create the elements) the act of creation based on intent/desire (sankalpam) cannot be by non-sentient (like space, etc. ), it is clear that it is emperumAn to whom these state/entities are His body and He in the form of those respective elements creates the next ones, and so He would have to be the creator. If this pAsuram is about removal of doubt about equivalence of the three lords, why is the meaning given above as creation of material realm? It is to show that for the One who created the core elements that are the source for creation of spherical world (aNdam), then there is no prospect of Him being considered equal to those other two lords who are present/created within that spherical world. pal vERu samayamumAy – What it talked about above is samashti srushti (creations before formation of aNdam; creation of and without mixing of core elements (pruthvi (earth), appu (water), etc. ); creation of ingredients for further creation; without division of dhEvas, human, etc.). Now by the current phrase, it is talking about vyashti srushti (creation of spherical worlds, their enclosures (AvaraNam), and fourteen layers in them, in clearly diversified forms by mixing of the five core elements (pancha bUthams) , twenty four thathvams (non-sentient elements); with explicit divisions as dhEvas, humans, animals, plants). Since brahmA (badhdha chEthanar – bound soul) is present without difference in the five core elements in singular (samashti) form, it is called samashti srushti. From such brahmA, subsequently, the other sentients are born within the spherical world in variegated forms – it is called vyashti srushti. (In the SrIbhAshyam book published in thirunArAyaNapuram, elaborate explanation is given about samashti srushti and vyashti srusthi). Creating the world of many and of different system/limitations (samayam), and of innumerable AthmAs, that is vyashti srusthi, is said as ‘pal‘ (many); it is unlike samasthi srushti where it is countable (five elements in separate forms). vERu is, being separate such that they are distinct and non-mixed, and so by their bodies they are being completely separate. samayam is system/limitation; being with the nature as per limitation of their category of creation (man being of specific set of behaviours, dhEvas being of some other set of behaviours, etc.). and the behavior of those other than the aforementioned categories, is to be under the loving shadow of noble men. It is said too as ‘dhAsya sukha Eka sanginAm bhavanEShvasthvapi keetajanma mE [sthOthra rathnam – 55]’ ((noble ones) are involved in your joy of servitude to you; it should occur that I be born even as a worm in such divine place of their residence). parandhu ninRa – Doing parandhu is permeating by following the jeevAthmA into (anupravESam) all the created bodies and being AthmA for everything (that is, without Him nobody would be able to do anything – here body includes brahmA, Siva et al). anupravESam is – setting Himself amicable to be inside the tangible material entity (sthUlam). Similar to how He is amicably present along with (viSishta) intangible/subtle forms (sUkshmam) of sentient and non-sentient, He is also amicably present along with (viSishta) tangible/concrete forms (sUkshmam) of sentient and non-sentient. Er uruvil – in beautiful bodies; Since by parandhu ninRa it says – eeSvaran who is present as AthmA for everything, for such eeSvaran everything in the visible world are bodies for Him as said in ‘jagath sarvam SareeramthE’, by uru it refers to world. (that is, all the things (like earth, what and who are inside earth, other worldly bodies, and so on, are all bodies for Him). Is it appropriate to refer to samsAris (people with interest in worldly things) who are to be shunned (by mumukshus), as Er uru (beautiful bodies)? For a mumukshu (liberation seeker), samsAram would be a place to be afraid of, and also would be acceptable; when looking at the visible body/world as attained due to being tied by karmas (and generate more karmas), mumukshus would consider it to be shunned; when looking at the world/people as being body of emperumAn as said in ‘jagath sarvam SareerathE’, then it would be considered acceptable. mUvarumE enna ninRa – Avoiding the notion that the world is of numerous chiefs, some vEdhAnthis narrowed it down (to three). This helped us to not have to reject individually the (numerous) chiefs who seem like ones to be worshipped, and gave us only a couple of them to be shunned (brahmA and Siva). In pUrva kANdam (first part of vEdham), it says ‘thrimSachcha dhEva: nava chAsaparyan threeNi SathA three SahasrANyagnim’ (three thousand three hundred thirty nine dhEvathas served me, the agni) – it says three thousand three hundred thirty nine dhEvathas as to be worshipped. vEdhAnthis say that only the One who is the reason for creation of the world is to be worshipped. From this, some would say that since there are three who are the reason for creation, sustenance, and annihilation, all the three are to be worshipped. Since saying enna ninRa – (be of stand as if (all three are equal)) – at a cursory look it appears as if all the three are equal, they would look like ones to be worshipped; but if we analyse it, there is not even a possibility of the two being equal (to emperumAn). As said in ‘brahma vishNu SivAthmikAm | sa samgyAm yAthi bhagavAnEka Eva janArdhana: || [SrIvishNu purANam – 1.2.23]’ (the distinct bhagavAn janArdhanan assumes 3 forms with the names of brahmA, vishNu and SivA to perform creation, sustenance, and annihilation), and so at cursory look it appears to be about equivalence, but with saying ‘janArdhana:’, as it refers to the substitute word of vishNu, it (the thought of their equivalence) is to be shunned. imaiyavar – (dhEvas) This is also a reason for the misunderstanding. Since they (brahmA and Siva) also do not blink their eyes, and since they are referred to with the word ‘dhEvas’, this term is being part of the misunderstanding. Even though it is common for all the (three) dhEvas, there is no possibility of equivalence, since it is said as ‘sAkshAdhdhEva: purANOsau’ (this emperumAn who is of all ages, is the Only dhEva), the quality of dhEva is present only in Him at all times (unlike for others when it is present only from some point). than thiruvuru vERu eNNumpOdhu – When thinking about their individual nature/activity (creation, sustenance, annihilation), it is capable of creating such misunderstanding. Why praise the ones who are shunned, as ‘thiru uru’ ? AzhvAr is talking so this way because like their nature/acts, their body is that of emperumAn (Sareera Sareeri bhAvam). Or uruvam etc. – This is talking about the individual nature/characteristics of them that are a reason for the misunderstand that they are equivalent. Or uruvam pon uruvam – brahmA’s nature is that of gold; gold is such that – all the ornaments could be made from it; in the same way (brahmA’s nature) would appear to be eligible for creating all the fourteen worlds; since he is the one from whose body all the things are created as he is the one for creation of all the bhadhdhAthmAs (sentient – bound souls). onRu mA kadal uruvam – being remover of sadness for those who see, the ocean’s nature is to keep within itself and save, everything from bad things, good things, gems and such, etc., isn’t it? in the same way, if we see the nature of eeSvaran (emperumAn), He is the remover of sadness to those who surrendered to Him, and keeping them under His love and protecting them would be seen as the nature of Him. The reason/source of the world is to be found only in the one where all these qualities are present isn’t it? Since these three nature are in these three, it is such that one could mistake that all the three are responsible for the reason/source of world (jagathkAraNam). oththu ninRa – being together. That is – each of their nature is together with their acts of creation, sustenance, and annihilation. Next it talks about removal of the misunderstanding. mu uruvum kaNda pOdhu – When knowing these three thathvams by using authoritative reference. (Aren’t the other AthmAs also having lustre by themselves?) – the thEjas (lustre/light) that is of the creator, and being the constituent (Sareeree) of bodies, and being lord (SEshi), is only of the One isn’t it? The other two would be of the nature of being created, of being a body, and of subservience; If asking where have we seen this – ‘EkOhavai nArAyaNa Aseeth’ (it is well known that only nArAyaNan was present (in a form)), that is, it is saying about the One who is the reason for the world (because He was the only one present in a form), and, ‘na brahmA nESAna: nEmE dhyAvA pruthivee’, similar to earth, etc., that are non-sentient, brahmA and rudhran are also said as effected to go through annihilation, and, by ‘sa brahma sa Siva:’, (they are jeevAthmas only), et al, it talks about them as jeevAthmAs, and as having subservience, and, ‘Esha sarvabhuthAntharAthmA’ – by the world sarva (Everyone), it refers to everyone in which He is permeating; so, the fact that these two are among everyone, their being created (kAryathvam), they being jeevAthmas (kShethrathvam), they being subservient, and being part of body (of emperumAn) – are all well accepted by everyone (samprathipannam). Even though jeevAthmAs also have the lustre by themselves (svayam prakASam), but by saying ‘Am sOdhi’, it differentiates Him from the other AthmAs, due to their being controlled (and Him being controller). That is why, ‘nArAyaNaparO jyOthi:’, (light means nArAyaNan) and, ‘jyOthishAm jyOthi:’ (He is light for all the lights) had to be said. (Instead of splitting as onRu Am sOdhi, why not take the meaning of onRAnjOthi as – all the three would together become one (adhvaitham)) ? Saying ‘mUvurum kaNdapOdhu onRAnjOthi’ – would look to be according to those who argue there is brahmam only (and no jeevAthmAs etc). But since that is not AzhvAr’s philosophy, this is not according to their point of view. Moreover, AzhvAr in previous pAsuram had with clear separation sang minnuruvAy, and, pinnuruvAy, and, ponnuruvAy, about the three separate thathvams (sentient, non-sentient, and eeSvaran), and in this pAsuram, saying ‘Er uru’, (beautiful form) to mean Sareera Athma bhAvam (others being bodies, and Him being AthmA for everyone), and later (in 4th pAsuram) he is saying ‘indhirarkkum piramaRkum mudhalvan thannai‘ (lord for indhra and brahmA), there is contradiction to their point by way of other pAsurams also. 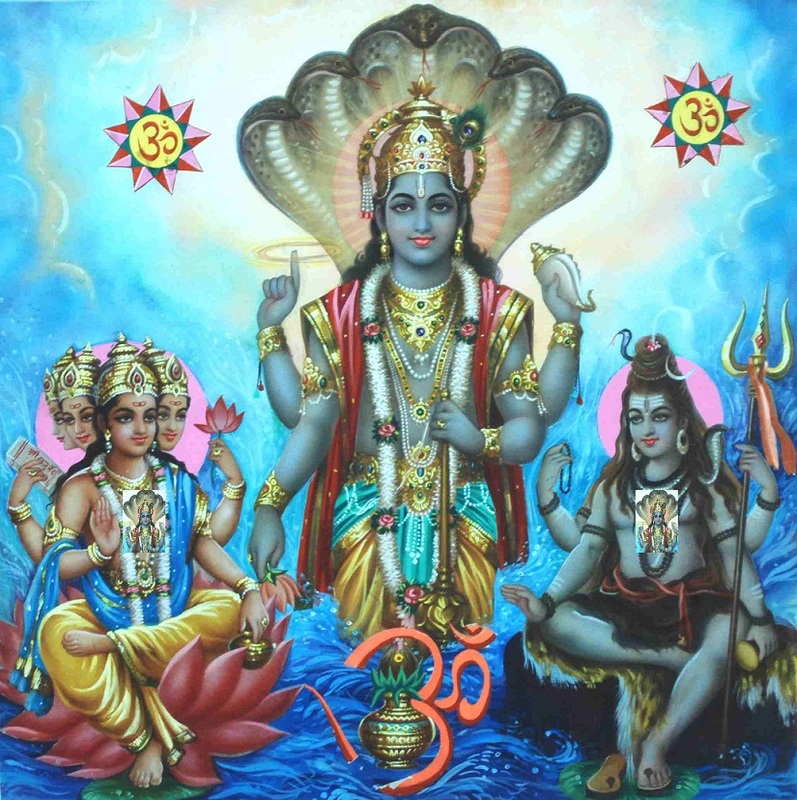 em adigaL uruvam – mugil uruvam – my lord’s form is black like that of rainy clouds; earlier where he said ‘onRu mA kadal uruvam’, as similar to the nature of ocean, it was meaning that He is protector; Now – it is talking about His divine body; (Because) It is this form that identifies His sarvAdhikathvam (being the first of all things; being lord of/distinguished from every one). thAnE – (But wasn’t that said as the colour of gem/diamond in pAsuram 1?) The body which was said as ‘maNi uruvil bUtham aindhAy [thirunedunthANdakam – 1]’ IS the one that is like that of dark rainy clouds, you see! There it said ‘maNi uru’ because He is being pleasant and favourable like how one could keep a gem easily tied in the tip of their cloth, and it is bright, and extremely priceless, and enjoyable. This entry was posted in iraNdAm Ayiram, thirunedunthANdakam and tagged thirunedundhandagam on June 12, 2017 by raghuram.